I’m going to go ahead and apologize in advance for the length of this post. It has been an insane week at work and both of my children have decided that they don’t feel like sleeping through the night. Put those things together and I just don’t have a ton of time on my hands. I still made all the gifs, but I can’t seem to find the time to write up as many as I would like. With that being said, let’s look at a few plays from this past week’s game. When I name gifs as I’m making them, it’s usually something that gives me a general indicator of what the play was. “MVS Quick Out” or “3rd Down Hail Mary.” Something that gives me a quick reminder when I’m going back through. My first inclination was to name this one “Jumbled Mess” and I feel that name is apt. None of these routes look complete. They all look either half-formed or half-run. In addition to that, all of routes stick around in the middle, making for extremely tight/non-existent windows. Davante Adams  is running a dig from the left side and appears to be Aaron Rodgers’  first read. There is a small window there directly out of the break, but Rodgers had already moved on when he saw the CB dropping underneath. Jimmy Graham  is pushing up the field from off the right side, Marquez Valdes-Scantling  is running a corner route from the slot while Equanimeous St. Brown  is running a dig from the outside under the corner route. You’ll see that the routes from Adams, Graham and St. Brown all end up around the hashmarks, while Valdes-Scantling doesn’t veer enough to the corner to stay clear of the mess. Byron Bell  gets beat (easily) with a move up the middle, forcing Rodgers to vacate the pocket earlier than expected, but all of these routes are kind of petering out before it gets to that point. 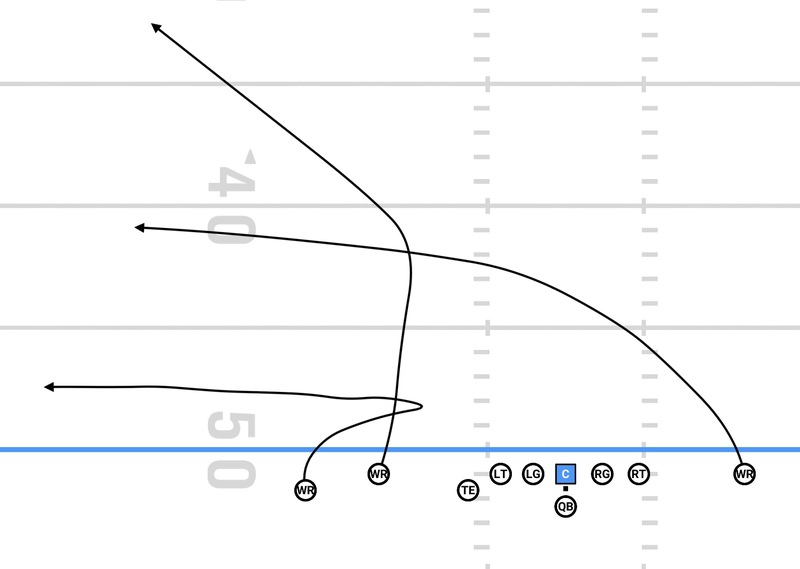 It almost looks like this play was written in pen but it ran out of ink before it was complete, so all the receivers ran until the pen ran out and just figured it was good. Adams and St. Brown need to finish crossing across the field. Valdes-Scantling needs a wider break to the sideline. There is a lot of space on the football field and the Packers used precious little of it here. They made this entirely too easy for the Cardinals to cover. Rodgers ends up hitting the checkdown to Aaron Jones  for a pick-up of 6 yards to salvage the play, but this whole thing just looks like a mess. It was the second passing play of the game and it did not exact exude confidence. Ah yes. Bootleg levels. Same general idea as something we looked at last week, but not exactly the same. We’ve still got the pivot/corner look that we saw last week, but this week we get a bonus crossing pattern. The pivot route from Valdes-Scantling works the shallow area, the corner by St. Brown works the deeper area and the crosser from Adams works the middle. I’ve talked about this with levels before, but let’s say it again: the idea behind this is to put multiple receiver in the same line of sight for the quarterback, but spaced apart enough to give each of them room to operate. The Cardinals are in zone on this play, meaning the Packers are putting three receivers in an area with only two defenders. The underneath zone defender plays it well; he sags off Valdes-Scantling and sits back to be able to pick up Adams on the sideline. He is essentially conceding the underneath route, knowing he can come up and make a tackle if he needs to. Still, Adams has a nice open swath of field before he gets all the way to the sideline, should Rodgers need him. As it turns out, St. Brown runs past the defender and gets to the corner. Unfortunately, Rodgers throws behind and St. Brown can’t come up with the catch. Still, it’s a good look. 3rd & 8. Let me spell that out for maximum impact. THIRD AND EIGHT. They’ve got trailing posts set up on the left, but those are covered up. Beyond that, they are both run a few yards past the sticks with no option to hit them earlier in space, should it appear. Then you’ve got a stutter-and-go with Davante Adams on the right, looking for a shot. Lastly, you’ve got two checkdown options. But both of them are only a yard past the line of scrimmage and would require a Herculean effort to get the first down. Let’s talk about the dual posts. The idea is that the first post will draw the attention from the interior defenders, leaving the outside post one-on-one with his man, with inside position and relatively free reign inside. It gets wrecked here because Antoine Bethea  effortlessly passes off the first post and falls under the follower. Once that is over, it’s on Adams to beat Patrick Peterson  deep up the sideline. Even if he does that, Rodgers has been shaky on his deep ball this year and the rush gets through the line so quickly he wouldn’t even have a chance to get it over there. So on 3rd & 8, you’ve got 5 receivers, but only one or two real options. No rubs. No misdirection. No anything. Just throwing it out there and hoping something shakes. And it didn’t. Let’s end with a fun one. Give me stacked looks with Jimmy Graham all day. On the left side we have Graham and Valdes-Scantling in an offset stack. Graham is even with the line of scrimmage on the inside, while Valdes-Scantling is set slightly back and outside. At the snap, Graham runs directly to the flat while Valdes-Scantling angles inside tight off the route of Graham and curls to the outside. Let me just list all the things I love about this. 1. Even though the previous play was an incomplete pass, the Packers got up and went no-huddle for this play. 2. They didn’t quick-snap it, but they didn’t let the playclock run down to 2 seconds, either. The Packers are known to run it down, so you can see the Cardinals defenders still communicating a bit and not quite set how they should be. They ended up snapping it with about 8 seconds on the clock. Not a ton, but going no-huddle allows for more time to read the defense before snapping, even if you’re not quick-snapping. 3. The routes are run so tightly together. Valdes-Scantling is right on Graham’s hip. It’s beautiful. 4. The turn from Valdes-Scantling is to the outside. You can see the interior linebacker watching to pick up the inside curl from Valdes-Scantling. By turning outside, he stays out of the middle and more space is created. 5. Rodgers sees this all the way. He hits the top of the drop and gets the ball out on-time and on-target. There’s a lot to like here. It’s a good concept, run perfectly against a defense caught off guard. A nice 11 yard gain and a 1st down conversion. 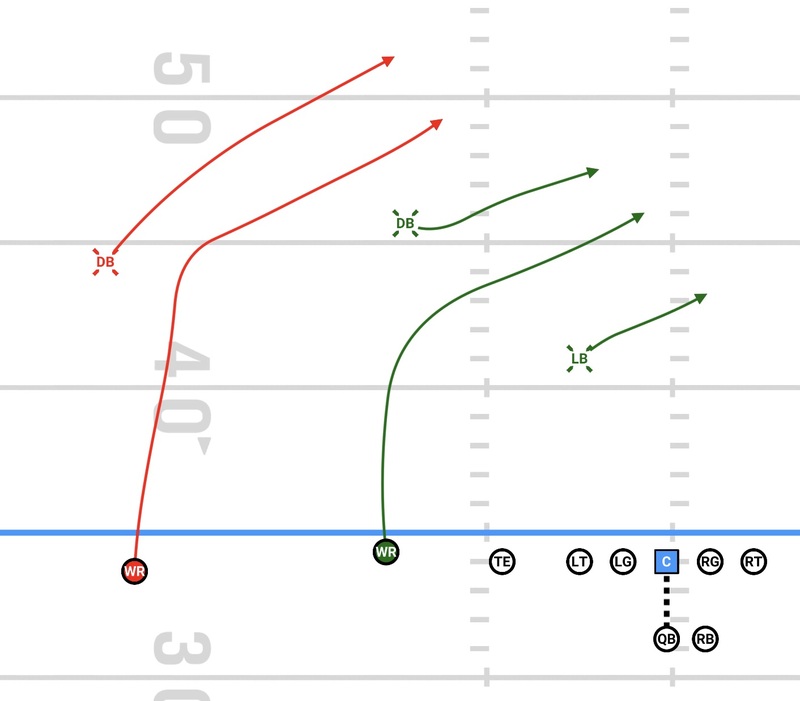 When we talk about quick-hitting plays, it’s not just slants. These little spacing plays can be huge for this offense. Traditionally this is something Randall Cobb has done extremely well. It’s cool to see that Valdes-Scantling has a bit of it in his arsenal as well. That’ll do it for this week. Again, apologies for the abbreviated nature of the post this week. Rodgers dropped back to pass 51 times this week and I could only write about 4 measly plays? I don’t even deserve to be here. I’ll be putting more plays up on Twitter eventually. Although at this rate, it may not be until the offseason. I have failed each and every one of you. Let me end on something I’ve said far too often the past few years. Unless a ton of things break right, the Packers are looking at their season ending before the playoffs begin. That’s a shame, but I will implore each and every one of you to keep watching the games. This team may be tough to watch at times, but there are always reasons to watch. Try watching the game in a different way than you normally would. Are you curious about how dominant Kenny Clark has been? Just watch him on every defensive snap. Curious to see how David Bakhtiari looks in run blocking? Watch him. Try to spot mismatches before the ball is snapped, then see how it plays out. You can learn a lot about the game by shifting your vision.